I haven’t driven my dirtbike in a very long time, and I almost never drove it in the rain or on wet roads. But sometimes you get caught in the weather, and highway speed become extremely dangerous. Luckily the two riders managed to keep each other safe in this clip after a major wipe out in the wet. In the video below, which may have been originally posted to this Reddit thread and since deleted, I have no idea whether the riders were speeding, whether they are friends or partners, or how they ended up caught on a very, very wet road. What I do know is their instant reaction to hold on to each other while sliding across the road at what appear to be highway speeds is a great example of human reflexes, and also kind of super adorable. Again, I have no clue who these people are, where they are, or the legality of their actions. It looks to me that they may have been going too fast for the conditions. Add in a possibility for oil or something else on the road, and the result is a very fast, very dangerous slip’n’slide. They appear to be okay, with maybe a few bumps and bruises, and the worst being something broken or a concussion. The girl’s helmet doesn’t appear to fit very well, but they otherwise look decently clothed. The hard hit at the end makes me cringe, but I think it was just the guy backing into the road barrier, shielding the girl from the impact. Again, when conditions are that nasty, take extra precaution. 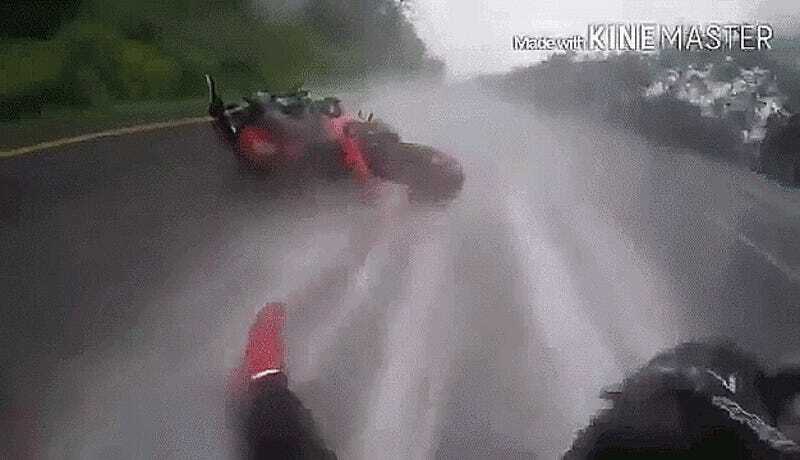 The reflexes and luck of these two isn’t universal, and you never know what variables you’ll face out on the road; car, motorcycle, or whatever vehicle of choice.